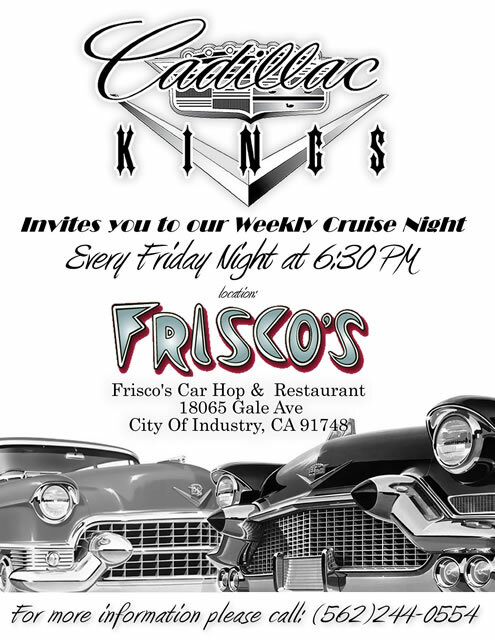 Cadillac Kings So Cal Get Together! We will be meeting at 5:25AM on Saturday December 12th, in the Del Taco parking lot off the 605 FWY (one exit south of the show). We will be meeting there so that we can line up and cruise into the show together. Please make sure that you arrive no later than 5:45AM because we need to be at the Mooneyes Show by 6:00AM. If you have any questions please contact me, Nicky at (562) 244-0554; I will have my phone on me at all times the day of the event so if you need to get a hold of me you can. You can also reach Derek, IE/SB Chapter President at (760) 490-1990 or Leo, Orange County Chapter President at (818) 291-3160.